On Saturday afternoon, eight Poky Pedalers explored the north side of the Village of Plover. Although the temperatures were a bit on the warm side, there was a gentle breeze that kept us comfortable as we poked around. On our 12-mile loop, we discovered that when you get away from the main thoroughfares, the village has plenty of calm streets through scenic neighborhoods that make for a pleasant afternoon of bicycling. 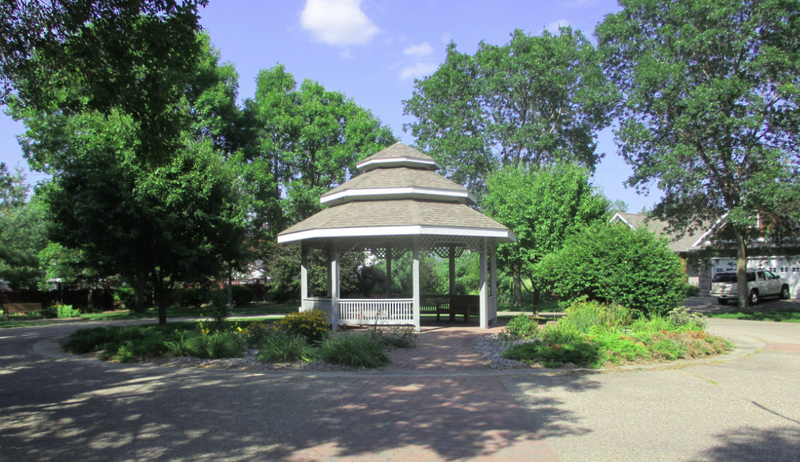 We visited the most elegant cul-de-sac in the county: the cul-de-sac of Victorian Lane, complete with a gazebo and brick sidewalks to complement the several Victorian houses along the street. We took advantage of the gazebo to take a rest and enjoy a few snacks. We marveled at a 4-foot-tall earth-toned concrete statue of a gnome holding a falcon. The homeowner happened to be there and informed us that it was indeed a gnome. 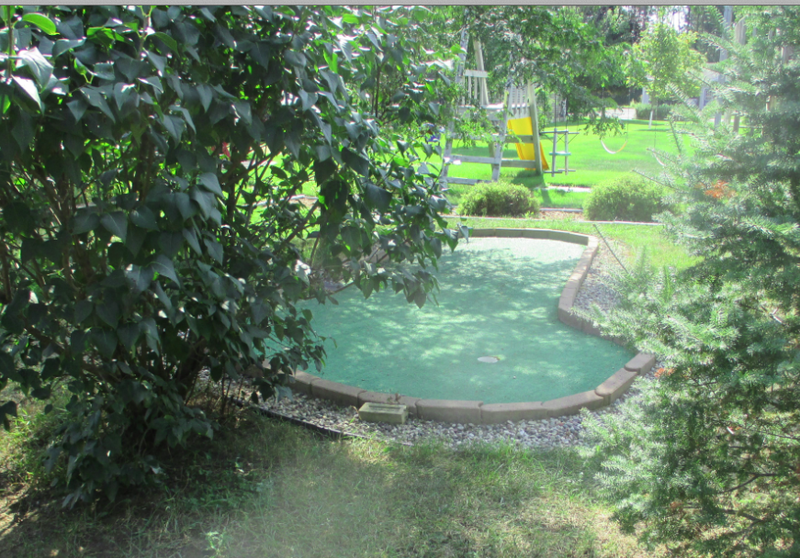 We discovered a secret miniature golf spot. If I revealed where, it wouldn’t be a secret anymore. Just south of our starting point in Little Plover River Park, we crossed the rapidly flowing river. It was good to see it at a healthy water level. We stopped at Springville Pond, which is an 18-acre impoundment of the river. The pond was named after a small community named Springville in the 1850’s. Springville only had about a dozen dwellings and was absorbed into what became the first incorporation of the Village of Plover in 1857. Just west of I-39, we stopped at a dirt path leading to the Little Plover River State Fishery Area. The Wisconsin Dept of Natural Resources creates fishery areas at rivers across the state in order to reduce erosion and run-off and improve habitat. We learned that the Little Plover River runs 6 miles from its headwater springs in the Town of Stockton to its confluence with the Wisconsin River just below Springville Pond. Average water flow has declined drastically over the past few decades and it has gone dry several times in recent years. In 2013, American Rivers named the Little Plover River one of the 10 most endangered rivers in the United States. 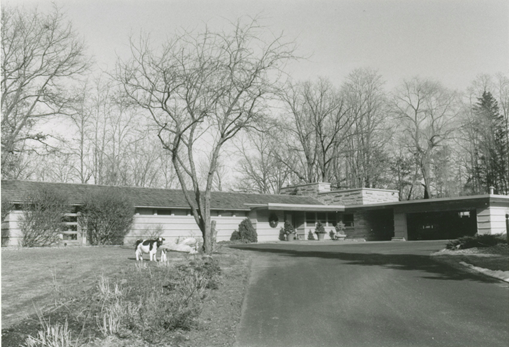 Perhaps the most significant highlight of the entire Poky Pedal was learning about the only Frank Lloyd Wright designed house in Portage County, located on the south bank of the Little Plover River just west of Post Rd. Vegetation limited our views of the house, but we had some photographs to pass around to get a sense of what it looks like. While there, we learned about the major features of the house. One Poky Pedaler recalled that the house has a swimming pool and that the owners used to allow local children to take swimming lessons there. We also learned that while discussing the layout for the house in the mid-1950’s, the owners found Wright frustrating to work with due to his being “notoriously uncompromising” and “autocratic”, as a 2002 Portage County Gazette article described him. In response to a few simple requests for modifications by the owners, Wright refused and stated, “If you don’t want it my way, then you can’t have my house!” Nevertheless, the owners seemed pleased with the final result. All in all, the north side of Plover was a pleasant and interesting area to poke around. There was plenty of scenery, history, and whimsy to fuel our Bike Fun. The Upcoming Poky Pedals webpage and the 2015 Bike Fun Calendar indicate that there are only a few more opportunities to share Bike Fun with PPSP this year. So make your plans to join us on the remaining Poky Pedals for 2015.